Associate Professor of Ecology Ricky Spencer from the School of Science and Health at Western Sydney University and a School-based member of Hawkesbury Institute for the Environment helped lead the Australian data analysis for the first global review of the conservation status of turtles and tortoise around the world. 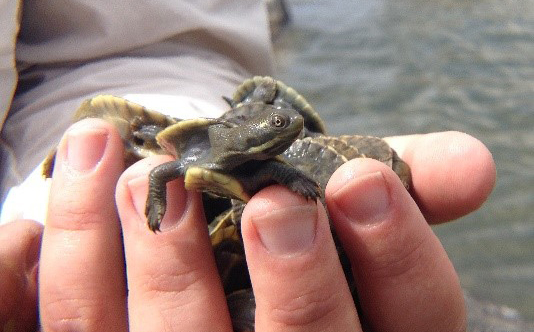 Associate Professor Spencer points to the current crisis in the Murray-Darling Basin that is affecting all aquatic wildlife, including turtles. “Australia deals with some unique factors leading to a decline in turtle population including introduced predators that ruthlessly destroy most nests each year, disease, road mortality and the fact that we are dry country and water resources have many competing demands,” Associate Professor Spencer says. Western Sydney University researchers were part of a specialist group of the International Union for Conservation of Nature (IUCN) that analysed the conservation status of some 360 turtle and tortoise species around the world. The report found that turtles and tortoises are some of the world’s most at-risk vertebrates with 56 per cent of species globally considered threatened; when including already-extinct species, that percentage rises to nearly 60 per cent. The data also revealed that Asia is at the epicentre of the global turtle extinction crisis. Huge numbers of turtles have been collected for meat consumption, the high-end international pet trade as well as shells and bones being used for traditional medicines. Other threats, including habitat loss, predators, invasive species, climate change and pollution, have been reducing populations even further. About 76 per cent of species in Asia are critically endangered or endangered, compared with 45 per cent in the Pacific and Indian Ocean Islands and 24 per cent in Australasia. Associate Professor Spencer says that while the average threat levels in Australia appear lower than in Asia, a further 22% of our local turtle species are considered vulnerable or near threatened and the conservation status of many local species remains unassessed. He adds that Australia is increasingly drawing on people power to improve our understanding of turtles. He cites the TurtleSAT project that allows people to report sightings. The report “Global Conservation Status of Turtles and Tortoises (Order Testudines)” was first published in Chelonian Conservation and Biology.